Wearing Custom Made Insoles can benefit everyone regardless of your age or chosen activity. Custom Made Insoles are 100% tailored to your two individual feet, naturally supporting every contour of your foot. The insoles incorporate medical grade materials individually selected for your needs for maximum comfort. Custom Made Insoles provide cushioning and shock absorption, the benefit of this is re-inforced by the body’s natural ability to absorb shock being improved by better foot movement. This combination helps to reduce the impact on your joints. The Custom Made Insole helps to naturally align your foot and maintain your body in an ideal position, improving posture. 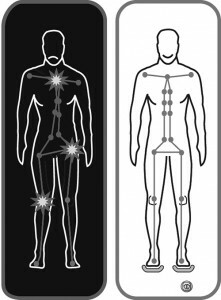 The combined benefits of shock absorption and improved alignment and posture can help to alleviate many biomechanical complaints such as heel pain, knee pain and lower back pain. By supporting and gently naturally aligning the foot, Custom Made Insoles can help to reduce discomfort caused by a range of medical conditions such as Plantar Fasciitis, Mortons Neuroma, Achilles Tendonitis and Arthritis. By improving proper foot movement, posture and stability, Custom Made Insoles can help to improve your performance on the Golf course, on your bike, when trekking or simply improve your confidence and stability. With improving foot function and alignment the levels of fatigue are reduced, improving on stored energy for later release. The range of custom insoles are specifically designed to individually support your personal biomechanical needs, with a dedicated team designing new materials for sports and complications alike.